You can easily reach some of the most beautiful places in the Dordogne from this sheltered spot among the trees. 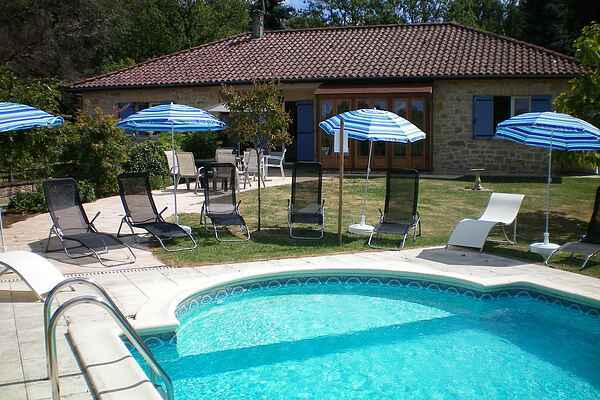 This holiday home on vast, private grounds, has all the luxuries you need and a large lawn with a private swimming pool. You can walk straight from the modern kitchen to the spacious patio, with garden furniture, where you can enjoy the green landscape. Both young and old will enjoy themselves in the colourful region of l'Appel de la Fôret near Thenon (15 km), a veritable adventure park. Périgueux (20 km), the capital of the Dordogne, is not to be missed. Perfect for a day of shopping, enjoying a delicious wine and local dishes on a terrace or playing golf at the 18-hole golf course. You will not believe your eyes in the caves of Tourtoirac and Lascaux near the charming Montignac ( 29 km). This is also where you can find the famous murals, visit the water park, go horse riding in the beautiful Le Bugue (30 km) and even go canoeing down the Dordogne River. Real culture lovers can get their fix at the Castle of Campagne (33 km) or the sweet village of Limeuil (35 km). The centre of Milhac D’Auberoche (3 km) has a bakery, supermarket and restaurant.